Sterling Parfums, the region’s leading Fragrance Company in private labeling and own branded products, announces the launch of ARMAF NICHE, a premium luxury fragrance line. 21-Jan-2014, Dubai: Sterling Parfums, the region’s leading Fragrance Company in private labeling and own branded products, announces the launch of Armaf Niche, a premium luxury fragrance line. 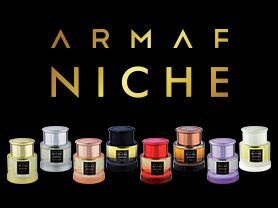 Armaf Niche, is a range of artisanal fragrances and uses only the finest raw materials known to the perfumery industry. All the eight fragrances in the range are crafted with refinement with the use of rich and deep ingredients such as patchouli, oud, cedar and amber.